At age 17, one month after graduating from high school, joined the Raymond Scott Orchestra. Toured the US from coast to coast. Then, attended the University of Miami on a music scholarship that had previously been awarded but was delayed until the Raymond Scott experience had been completed. 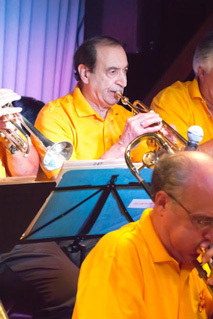 After college, served in the Army, but not before being asked to join the original Tommy Dorsey Orchestra – to replace their lead trumpet player who had been drafted into the Army. Unfortunately, had to report for Army service as well – two days after receiving the TD offer. Was fortunate to obtain assignment to the outstanding 4th Army HQ military and dance bands. Performed on and wrote music arrangements for a weekly radio show starring Vic Damone. Other well-known stars performed with, after Army service was completed, included Ella Fitzgerald, Lena Horne, Tony Martin, Eddie Fisher, Helen O’Connell, Danny Thomas, Buddy Hackett, Allen Jones, Martha Raye, Jan Murray and many others. Also played with the Jimmy Dorsey Orchestra (Lee Castle), the Billy Butterfield Orchestra, and the Pupi Campo Latin Orchestra. Venues performed at include the Waldorf Astoria Hotel (NYC). The Capitol Theater (NYC), Copa City (Miami Beach), the Palace Hotel (San Francisco), Bill Miller’s Riviera (Englewood Cliffs), and Cal Neva Lodge (Lake Tahoe) among others. Currently with the Full Count Big Band (since 2003) and several other fine NJ big bands.